ATS pro Terra Sancta have a couple of publications that they have placed online related to the Church of the Holy Sepulchre in Jerusalem. 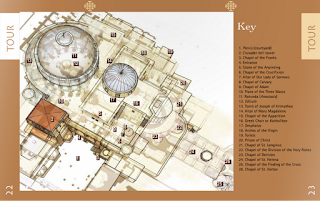 The Holy Sepulchre: The Pilgrim's New Guide. This is a small book containing some attractive pictures and helpful diagrams. You can access it here. I have included a screen capture of one of the book's diagrams below. The Holy Sepulchre in Jerusalem. This short four-page flyer can be accessed here.